Years ago I hacked my way through the undergrowth on the railway embankment from the footpath which used to run alongside Sir James Altham school to access this gem. Difficult now due to the more secure fencing. 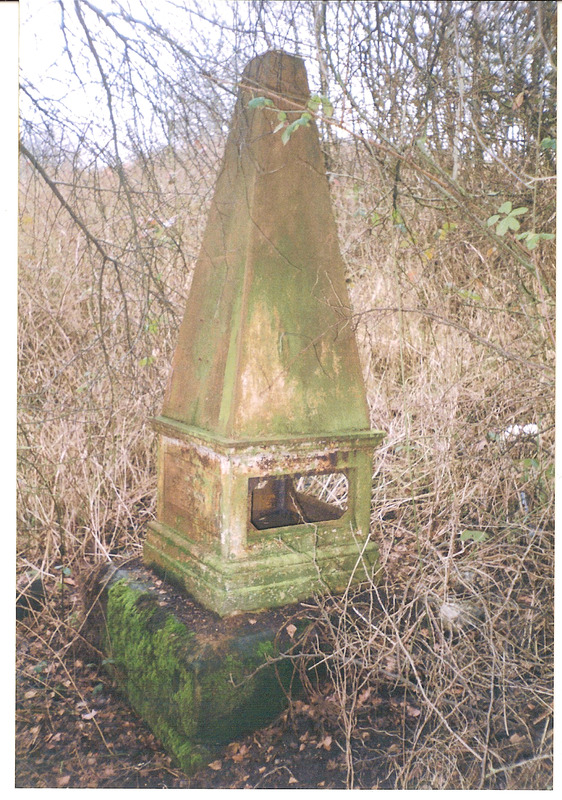 The photo is of a coal marker post Type B and is a grade 2 listed object-described by British heritage as follows. City of London coal Duty Marker. 1851. Cast by Falkirk Iron Co. Ltd.
open panels and a moulded cornice above which rises to a short obelisk. The whole measures at one and a half to two metres high. Marked extent of coal duty, originally 20 miles circumference from General Post Office, moved in 1861 to point on boundary of Metropolitan Police District. Duties were due on any coal passing these posts – I’m sure David Reidy will be along with some more details on these fascinating objects. Smaller types are situated in Oxhey Lane, Oxhey Drive and Batchworth Heath. Older pictures show this obelisk brightly painted in white with the railway embankments clear of all undergrowth, necessary to prevent fires in the old steam train days. This page was added on 08/02/2013. Yes it’s a shame about the appalling undergrowth along the embankments nowadays. In the 50’s and 60’s it was all just grass with great views in both directions. As kids we used to sit near that marker with our Ian Allen spotter books in hand watching the Royal Scots and Coronation classes thundering north and south along the fast lines. This picture was taken in the 1950’s showing the coal marker, and the Oerlikon train travelling towards Hatch End, having just past under the bridge in Little Oxhey Lane. This curious obelisk, now in a sad state, bears the arms of London and the obscure legend ” Act 24 & 25 Vict.Cap 42″. This refers to the London Coal and Wine Duties Act of 1861, and signifies that in those days any wine, coal or cinders- a strange category- passing this post were subject to a duty levied by the Corporation of London.The proceeds of this duty were allocated to the Bridge Building Fund and money from this source helped to fund the building of Tower Bridge.